On 10 December 2018, Metropolitan Hilarion of Volokolamsk, chairman of the Moscow Patriarchate’s Department for External Church Relations (DECR), arrived in Georgia with a working visit with the blessing of His Holiness Patriarch Kirill of Moscow and All Russia. 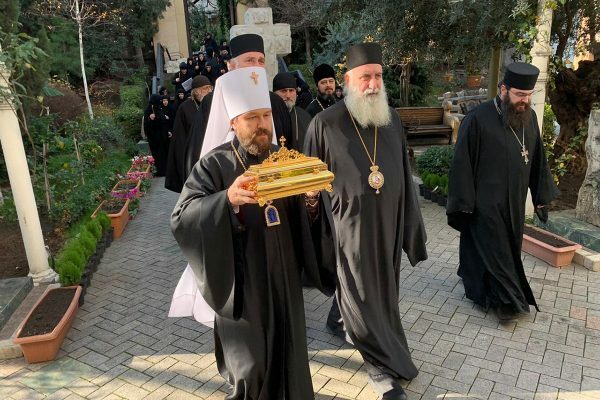 At the request of His Holiness and Beatitude Catholicos-Patriarch Ilia II of All Georgia, Metropolitan Hilarion brought a particle of relics of the hieroconfessor Famar (Marjanova) as a gift to the Georgian Orthodox Church. She has been canonized recently by the Georgian and Russian Orthodox Churches. The relics were met by His Holiness and Beatitude Ilia II, bishops, clerics and monastics of the Georgian Orthodox Church at the Patriarchal residence. A short prayer service was celebrated at the shrine with the relics. After the prayer service the DECR chairman met with His Holiness and Beatitude. They were joined in the meeting by six hierarchs of the Georgian Orthodox Church; rector of the Sioni Cathedral; archpriest Kakhaber of the Church of St. George in Moscow; archpriest Igor Yakilmchuk, DECR secretary for inter-Christian relations, archpriest Vladimir Aleksandrov of St. Alexander Nevsky church in Tbilisi, and Vyacheslav Lee, a Metropolitan Hilarion’s sub-deacon. His Holiness and Beatitude Catholic-Patriarch Ilia II conveyed his deep gratitude to His Holiness Patriarch Kirill for the precious gift – relics of hieroconfessor Famar whose life had been closely connected with the Georgian and Russian Orthodox Churches. Both Primates expressed confidence in the great importance of St. Famar’s prayers for the strengthening of fraternal ties between the Russian and Georgian people. Metropolitan Hilarion cordially greeted Patriarch Ilia on behalf of Patriarch Kirill, who sent a particle of relics of St. Famar to the Georgian Orthodox Church at the request of its Primate. She was canonized by the Georgian Orthodox Church in 2016, and the Russian Orthodox Church also canonized her as a confessor of the 20th century who went along her way of the Cross. “Today we glorify hieroconfessor Famar as a heavenly protectress of our two Churches and our people. I do hope that the saint’s prayers will be with us in our common work for the good of Holy Orthodoxy and united our nations by spiritual bond that abides in our hearts, crosses all earthly boundaries and will remain on earth and in the Heavenly Kingdom,” Metropolitan Hilarion said. Discussed at the meeting were topical problems of the inter-Orthodox relations. That same day the DECR chairman returned to Moscow.